Home > Departments > Faculty > Shelly Tenenbaum Ph.D.
Ms. Tenenbaum received a B.A. from Antioch University and a Ph.D. from Brandeis University. She has been at Clark since 1986 and is the coordinator of undergraduate activies for the Strassler Family Center for Holocaust and Genocide Studies. Ms. Tenenbaum received Clark's Outstanding Teaching Award and the Outstanding Academic Advisor Award. She is also affiliated with Women's and Gender Studies, Race and Ethnic Relations, and Jewish Studies. 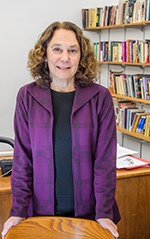 Ms. Tenenbaum's research on ethnic enterprise, mutual aid, gender, education, and identity intersects the broad areas of sociology of American Jews and historical sociology. Her book, A Credit to their Community: Jewish Loan Societies in the United States, 1880-1945, explores the relationship between immigrant Jewish credit networks and ethnic enterprise. Ms. Tenenbaum's co-edited anthology, Feminist Perspectives on Jewish Studies, provides a critical evaluation of the impact of feminist scholarship in the various fields of Jewish Studies. In addition, she co-edited a syllabus collection Gender and Jewish Studies: A Curriculum Guide. Ms. Tenenbaum teaches in the areas of race and ethnicity, Jewish Studies, comparative genocide, gender, and social stratification. "Jewish Studies and the Anxiety of Interdisciplinarity: A Collaborative Conversation About the Introductory Course,” Shofar: An Interdisciplinary Journal of Jewish Studies, Summer 2014: 35-44 (with Lori Lefkovitz and David Shneer). "It's In My Genes: Biological Discourse and Essentialist Views of Identity Among Contemporary American Jews," Sociological Quarterly, Vol 48, Summer 2007: 435-450 (with Lynn Davidman). "Who Rules America?" Teaching Sociology, vol.34, number 4, October 2006: 389-397 (with Robert J. Ross). "The Vicissitudes of Tolerance: Jewish Faculty and Students at Clark University," Massachusetts Historical Review, vol. 5, 2003: 7-27. "Community Self-Help: San Francisco Jews and the Great Depression," The Jewish Journal of Sociology , vol. XLV, numbers 1 and 2, 2003: 34-45. "Borrowers or Lenders Be: Jewish Immigrant Women's Credit Networks," in Pamela S. Nadell (ed.) American Jewish Women's History: A Reader , New York: New York University Press, 2003: 79-90. "Good or Bad for the Jews? Moving Beyond the Continuity Debate," Contemporary Jewry , vol. 21, 2000: 91-97. Gender and Jewish Studies: A Curriculum Guide, New York: Biblio Press, 1994 (edited with Judith Baskin). Feminist Perspectives on Jewish Studies, New Haven: Yale University Press, 1994 (edited with Lynn Davidman). A Credit to Their Community: Jewish Loan Societies in the United States, 1880-1945, Detroit: Wayne State University Press, 1993.